Pit the dates by making a cut in one side. Fill each cavity with walnuts. Roll each date in the salt. Put them in a frying pan and cover them with honey generously (enough to coat the dates and cover the bottom of the pan). Cook them under medium heat until they are carmelized. Remove to a lightly oiled plate to prevent sticking. Variation: instead of walnuts, use blanched almonds rolled in cinnamon. My mother used to make this. She shared the recipe with my ex-fiance's mother who made it and took it to her place of employment. It proved so popular that by demand she now has to make it every holiday season and bring it to work. These recipes all sound awesome! I love that we're coming up with a catalogue of cherry cake (and pie, etc.) recipes. I'll try to come up with something myself and post it... For now I'll act as cake cook-off cheerleader. The flour and baking powder should be mixed and sieved. Then make a swale(?/ hole) in the middle and put all other ingredients into it. Mix/knead all ingredients with your fingers until you get a homogenous dough. Let the dough rest in the fridge for 30 to 40 minutes. The dough should always be cold, so take only a part from it out of the fridge. Roll the dough equally out (should only be some millimeters thick). Then cut forms out of the dough and put them on a buttered baking tray. Brush the forms carefully and thin with egg yolk. But them into the oven for 8 to 12 minutes (depends on your oven and on how thick you rolled the dough) at 180°C (equivalent to 356° Fahrenheit). When the dough gets too soft from repeated kneading and rolling, put it back into the fridge and take another (cold) part of it. Additionally you can decorate the cookies with colored sugar granules or chocolate granules, or put two cookies together with jam between them. Thanks for the great cookie recipe, Chrissi, and thanks, too, for including the alternate measures. Lauren, thanks for the TWO cherry cake recipes. How to choose....?! Okay, first in German, then in English. Weiche Butter oder Margarine schaumig rühren, nach und nach Zucker, Vanillezucker, Rum, Salz und Eier zufügen. Mehl und Kartoffelmehl mit Backpulver mischen und eßlöffelweise unterrühren. Bei Bedarf etwas Milch zufügen, der Teig soll schwer reißend vom Löffel fallen. 2/3 des Teiges in eine gefettete Kastenform füllen. Kakao mit Zucker mischen und mit etwas Milch unter dem restlichen Teig rühren. Dunklen Teig auf dem heilen verteilen und mit einer Gabel spiralförmig unterziehen. Marmorkucken im vorgeheizten Backofen bei 180 C (Gas: stufe 2-3) ca. 50-60 Minuten backen. Mix butter or margerine with sugar a bit at a time, then add the vanilla sugar, rum, salt and eggs. Mix the flour and potato flour with the baking powder, and stir in with a tablespoon. Add milk as needed so that the batter falls stiffly from the spoon. Put 2/3's of the batter in a buttered loaf pan. Mix the cocoa and sugar with some milk into the remaining batter. Spread the dark batter over top of the light batter and make downward spirals with a fork. Put the marble cake in a preheated oven at 180 C, for about 50 to 60 minutes. Some of this stuff may not be available off the European continent very easily, but it is a flexible recipe and easy to substitute! Make sure the oven is well heated... today I had success whereas other times I did not heat the oven up in enough time or stir the batter enough. Also - I use half of this recipe for a normal loaf pan! So cut amounts in half unless you have a LARGE loaf pan, otherwise you may be scraping volcanic lava off your oven. I put four packets of baking powder on the scale and as best as I can tell, they weigh 10 grams a piece. The amount it specifies is "for 500 grams of flour." I'd say a packet of baking powder is two teaspoons. I've googled a little bit and found that a packet baking powder conatains 15 - 16 grams. That's 1/2 oz. 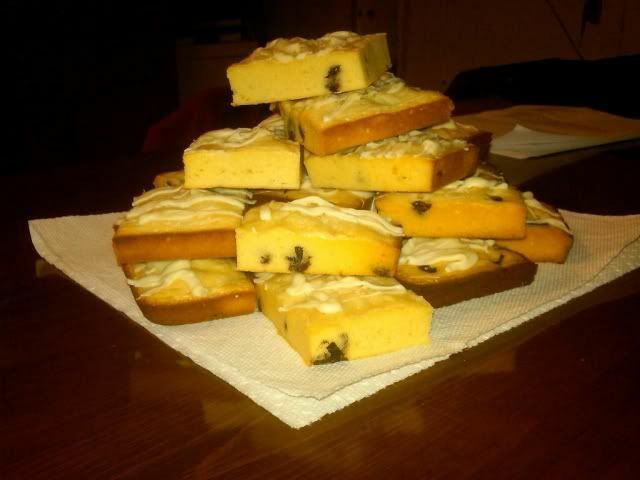 BTW: Marmorkuchen (marble cake) is not a special Christmas cake in Germany. It's eaten the whole year. At Christmas, too . This is no throw-together dessert, but oh boy, it's worth it. Satisfying and delicious. Stir the flour, sugar and salt in a large bowl. Cut in the shortening until the mixture resembles coarse cornmeal. Stir the water and yolks together in a small bowl. Using a fork, stir into the flour mixture to make a soft dough, adding a bit more water if needed. Gather up into a ball, then divide into 4 equal portions. Pat each portion into a 5" x 4" rectangle (will make it easier to roll out later), wrap in plastic wrap and refrigerate at least 30 minutes, up to 2 hours. Cut 1/4" slices from 4 of the apples, turning the apples as you reach the cores to slice from all sides. Grate the other 2 apples on the large holes of a box grater, turning the apples when you reach the cores. Discard cores. Combine all ingredients in a covered medium saucepan over medium-low heat until the apples give off some juices. Uncover and cook until the sliced apples are barely tender, about 8 minutes. Transfer to a bowl and let cool completely. Process the walnuts and sugar in a food processer until very finely chopped. Transfer to a medium saucepan and add the water. Bring to a boil over medium heat, stirring constantly. Cook until thickened to a moist paste, about 3 minutes. Transfer to a bowl and let cool completely. Cook the poppy seeds, sugar and water in a small saucepan over medium heat, stirring almost constantly, until the mixture has thickened into a moist paste, about 2 minutes. Transfer to a bowl and let cool completely. Preheat oven to 400 degrees F. Butter the inside of an 11-1/2" x 8" baking dish. On a lightly floured surface, roll out a portion of dough into a rectangle the size of the baking dish. Place in the dish and spread evenly with the apple filling. Roll out a second rectangle of dough and place over the apple filling, pressing lightly to make as flat as possible. Spread with the walnut filling. Place a third layer of dough over the walnuts and spread with the poppy seed filling, then top it with a last layer of dough. Pierce the top dough with a fork in a few places. Beat together one large egg yolk and 1 tsp. heavy cream or water and brush some of it over the top dough. Place on a baking sheet in the center of the oven and bake for 10 minutes. Reduce the temperature to 350 degrees and bake until the top is golden brown, about 50 minutes. Let cool for 15 minutes. Run a sharp knife around the inside of the pan. Hold a baking sheet over the pan and invert to unmold the dessert in one piece. Hold a rack or tray over the unmolded dessert and invert again so it is right side up. Cool at least 2 hours. For best flavor, wrap in plastic wrap and let stand overnight before cutting. Cut in half lengthwise, then crosswise into sixths to make 12 bars. Serve at room temperature. Soak the bread in milk until soggy; beat to break up. Stir in the shortening, sugar, eggs, orange juice concentrate, vanilla and brandy flavoring. In a separate bowl, combine the raisins, dates and walnuts. Mix the rest of the dry ingredients and add; then stir in the bread mixture. Pour into a lightly greased baking dish, cover with foil. Place in an ovenproof Dutch oven or roasting pan on a rack or trivet. Pour water in the bottom of the pan to cover about 1/2 inch of the bottom of the baking dish. Cover the Dutch oven or roasting and cook at 350 degrees for about 2 hours. Check once in awhile and add more water if it's getting low. Brandy sauce (brandy optional): Mix one cup powdered sugar with 1 tablespoon butter, 3 tablespoons orange juice concentrate 1 tsp vanilla, 3/4 tsp brandy flavoring. Stir in enough milk to make a sauce; adjust thickness as desiired with more powdered sugar. SInce this recipe requires a roasting pan so it might be awkward for Christmas Day, but it's great for a day after Christmas special dessert. Here's a pie I am making for the second time during this holiday season, and I think it's not the last!! Make the crust: in a bowl combine the walnuts, pecans, sugar, and butter, and press into a 10-in (5-cup) glass pie plate. Bake in preheated 350-degree oven for 12-15 minutes, or until lightly browned, and let cool. Make the filling: IN the top of a double boiler set over simmering water, melt together the chocolate and the butter until the mixture is smooth. Transfer to a large bowl and mix in a pinch of salt, the egg yolks, the Kahlua, and 1/2 tsp. Of the vanilla, combining well. In another bowl, beat the egg whites until they hold soft peaks, add the sugar, and beat again until they hold stiff peaks. Stir one-third of the whites into the chocolate mixture and fold in the remaining whites. Spoon the filling into the prepared crust and chill the pie for several hours. In a chilled bowl, beat the heavy cream until it holds soft peaks. Add the remaining vanilla and beat until it holds stiff peaks. Spread the cream over the pie with a spatula and sprinkle with the pecans. Chill the pie before serving up to 24 hours. Oh boy, that sounds great, Lee! That is a pretty easy pie since you only have to bake the crust. If you like, you can substitute any regular crust, even those that are rolled out from a package. If you make the nut crust, don't put pie weights in...I did, and then I had to dig them out. Also, make this pie in a large (9-in diameter) pie pan, because otherwise you'll have filling left over, and the pie is so popular that it will be gone too soon if it's just an 8-incher. For the semisweet chocolate, I substituted special dark chocolate because it was all I had and there was a blizzard outside!! In fact, I think it improved the pie. There is also a recipe called Jacques Cagna's Chocolate Mousse Cake which is very similar, is a more sophisticated presentation, which I make almost every year and is available on the web. Anything with Jack in it!! These recipes all sound great! I especially love the one that tamarack put up - the Cherry Festival Cake. I'm a 50's child and my mom used to make this cake each and every Christmas without fail. It just wasn't Christmas without this cake. I moved to Florida when I was in my early 30's and gone was the cherry cake. One year I phoned her and asked her for the recipe and she gave it to me. I've made it a couple of Chrismases since then, and it makes Christmas complete for me! My Mom has made these for years. She uses pecans and I use walnuts; both make very rich cookies. I've thought of making this recipe using cashew nuts, but haven't yet gotten around to it. Mix softened butter or margarine, powdered sugar and nut meal. Stir in vanilla and water. Then add flour and mix until it forms a stiff dough. Form into small flat cookies or roll into crescent shapes, and bake on a greased cookie sheet, 20-25 minutes at 325°. While the cookies are still hot, dust with or roll in additional powdered sugar. Yum, those sound good, and easy, too. Thanks, Marge! Thanks for the great recipe Marge! It sounds like these would just melt in your mouth! maybe some of you heard that cranberries is an First Nation food called atoka ? Combine. Store to freeze until set. Me dire vos résultats (tell me your results) ?? Do not attempt this recipe!! I made it for New Year's Day and realized that my lovely recipe has been "dumbed down" for the Internet. The egg whites did not whip in a food processor, and the chocolate took forever to be grated!! I will find my old recipe and post it here!! Okay, here is the recipe for Chocolate Mousse Cake that I promised you back in 2006! Thanks for waiting!! This cake is very light but rich tasting. It can be made into a buche de noel as well. Butter sides & bottom of 1 qt glass loaf pan. Line bottom with parchment paper and butter paper. In food processor, grate walnuts. Spread 1 c over bottom & sides of prepared pan. Put egg whites in clean food processor work bowl. Process 8 seconds, the pour in combined vinegar & water while machine is running. Process for 1 minute & 45 seconds, or until egg whites are whipped & hold their shape. Gently transfer to mixing bowl. Do not wash work bowl. Put chocolate, cocoa, sugar, & salt into work bowl. Turn the machine on & off 4 times to chop the chocolate coarsley, then process for 1 minute until chocolate is finely chopped. With the machine running, pour the hot butter through the feed tube and process for 1 minute, until the chocolate is completely melted, stopping once to scrape down the sides of the workbowl. Add the egg yolks and process 10 seconds. Spoon egg whites onto the mixture in a ring. Turn the machine on & off twice. Run a spatula around the sides of the workbowl to loosen the mixture. Turn machine on & off 3 more times until the ingredients are mixed. Some streaks of white may be visible; do not overprocess. Transfer to the prepared pan. Cover with plastic wrap and refrigerate for 3 hours, or until well chilled. Carefully separate the mousse from the pan using a thin knife or flexible spatula. Invert onto a serving platter and remove the pan. Press the remaining walnuts into any bare spots. Let the loaf set at room temperature for 1/2 hour before serving. Note: the mousse can be prepared up to 1 month in advance, covered airtight and frozen. Let thaw, covered, for 24 hours in refrigerator. Inspired by Chuck's account of his trip to Georgia, I'm posting a recipe that's considered a Southern classic, although it originated in Noo Yawk. Most recipes for Red Velvet cake are similar. Of course, there's always a cut-to-the-chase option in the form of the Duncan Hines mix. And a Google search of recipes turned up vegan and gluten-free alternatives. Sift the flour, sugar, baking soda and cocoa powder into a big bowl that you’ll use to mix the cake. Using a hand or table mixer, put in the milk. Mix. Add oil and mix. Add vinegar, vanilla and almond flavoring. Mix. Lightly beat the eggs in a small bowl. Add and mix. Add the food coloring. Mix until the batter is even in color. Pour the batter into three 8-inch or two 9-inch cake pans; bake at 350 degrees F for 30 minutes or until the center tests done with a toothpick. Beat the margarine and cream cheese in a medium mixing bowl until light and creamy. Add vanilla and confectioners sugar and beat well. Hand stir in pecans, saving about a half cup for garnish. 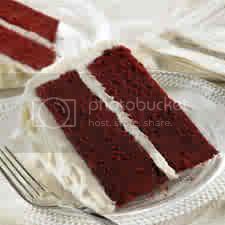 Spread cream cheese icing between layers of the Red Velvet cake, up the sides and on top. Sprinkle with the rest of the pecans. OMG! Red Velvet Cake with Cream Cheese Frosting! Thud! It doesn't get any better than Red Velvet Cake with Cream Cheese Frosting. I could eat a whole can of cream cheese frosting by itself ! I think I will make a Red Velvet cake for Thanksgiving !! Yup !!! Try it on gingerbread! Am not sure I've posted a gingerbread recipe in this thread; I'll check that out. First red velvet cake, now gingerbread. You guys are gonna kill me with home-baked kindness! Damn, I'm getting hungry here ! It's pretty easy to make. Yummy with lemon sauce. But I like it best plain, or with real whipped cream. What did you mean about a can of cream cheese frosting? Can you really get it in a can? I haven't looked lately, but I think Betty Crocker, or maybe Duncan Hines, used to include cream cheese in their line of canned, ready-to-use frostings. I could be mistaken in my memory, though. Ginger bread still warm from the oven with whipped cream is the best! Have I got recipes for the diabetics, sodium-intolerant and gluten intolerant among you! OR double the recipe and bake 180 degrees centigrade for 25 -30 minutes. >>>>Microwave 1 1/2 - 2 minutes or till set. >>>>to cut in half horizontally, if you wish to fill it with "icing"
Melt butter or margarine; mix in sugar and egg. In one bowl mix all dry ingredients; in another, mix molasses, honey and water. Add this mixture and the flour mixture alternately to the butter-egg-sugar mixture, beating well after each addition. Bake in a greased square cake pan at 350 degrees, about one hour. I'm just about ready to march into the kitchen and make some pumpkin pecan pie. I love it because it kills two birds with one stone, so to speak. That frees me up to make something more creative for my second dessert, and all of you have given me plenty of inspiration!! This recipe is simpler than all the other ppp recipes on the web, which call for things like sour cream and lemon zest. Try it, you'll like it!! I just got inspiration for my second dessert, in addition to the de rigeur pumpkin pie. How about ... ambrosia? But I'll serve it AFTER the meal, not before it, especially to bratty little kids. Just made my favorite icing recipe for my son's birthday cake. It's as easy as...cake!! 12 oz. of chocolate chips, melted with 2 cups whipping cream. Stir together in the pan, cool, and add 1 tsp. karo syrup. It's called "Mrs. Milman's chocolate frosting" as popularized by Martha Stewart. Amazing that I am a major contributor to this thread! I don't eat sweets, generally, but I like making them for others. I'm trying something different for Christmas dinner...a mincemeat cranberry pie. Will let you know how it is received. My Mom used to make this sometimes for Christmas dinner. It can be made to look extra-Christmas-y by adding halved maraschino cherries to the (green) top of the pie. It's a good dessert for a big family dinner because it's not only decorative but can be made the day before. I've often thought that a variation, substituting Amaretto or Cherry Heering for the creme de menthe would be tasty; but haven't ever tried it. Crust: crush cookies to make crumbs; mix with melted butter and pack into a pie pan to make a crust. Chill a few hours, till the crust is solid. Melt, then chill marshamallows and milk; best done in a double boiler or a saucepan set in a frying pan of boiling water. After chilling, add the creme de menthe and cream de cacao. Whip the cream, then folkd into the mixture. Pour into the pie crust and chill. The pie was a hit. I managed to get everyone to eat some, even though they'd just eaten back-to-back brunch and dinner. Even better, I served it with vanilla ice cream and crystallized ginger sprinkles!! Grease and flour an 8 inch square baking pan, or line with foil. Melt butter and 4 ounces of the white chocolate in top of a double boiler over hot water. When melted, remove from heat and add the other 4 ounces of white chocolate, stir to blend well. Set aside. Beat the eggs and sugar until pale and smooth. Add white chocolate and butter mixture, vanilla and flour. Beat just until smooth. Add semisweet chips and stir by hand, being carefull not to over-mix. Pour into prepared pan and bake for 35 minutes or until a toothpick inserted into the center comes out clean. Cool on a wire rack, cut into squares. My own little "twist", I melted some of the excess white chocolate I had and drizled them over the top. Looks yummy...I bet they were a hit!! I was at a party Saturday evening--two very dear friends celebrating 25 years together. There was a buffet, and the desserts included cupcakes. And then there were--what should I call them?--Oreo cupcakes? They were chocolate cupcakes with a cream filling in the center. The frosting probably started out as a basic vanilla frosting, but then it had ground-up Oreos added to the frosting, and each cupcake had half an Oreo stuck in the frosting on top. I've had those cupcakes before, very good! I've made this recipe for Sticky Toffee Pudding 4 times in the last month and there's no end in sight!! It is not really a pudding, more like a moist cake. This recipe calls for silicone muffin tins to bake individual cakes. That is a very easy, attractive and non messy way to make it, but it can be baked any way you like. It comes with a caramel sauce, but you could substitute whipped cream, a chocolate or raspberry sauce. This is a good holiday recipe. It's the pudding that carolers are asking for when they say "Bring us some figgy pudding..." and "we won't go until we get some!" I first enjoyed sticky toffee pudding in Britain and can't get enuff of it now! One more thing. The best figs to use are in vacumn foil packages by Sunsweet. They are very succulent and flavorful. Speaking of rice flour (as we were doing on the gravy train, er, thread) here is a recipe I found when I was trying to figure out what to do with the rose syrup that Chrissi gave me. It's wonderful!! In a saucepan, bring the sugar and water to a boil on med-low heat and simmer for 2 minutes. Remove from heat, stir in rose water and lemon juice. Cool to room temperature. The syrup should not be too thick. In a bowl, beat the yolks and 2 tsp sugar, add the ghee, cardamon powder and beat well. Stir in 1 1/2 cups rice flour and handful of finely chopped pistas. Add enough syrup to be able to form a dough (knead with hands) which doesnt stick to your hands. For that add more flour or more syrup, as required. Make walnut sized balls of the dough, lightly flatten, place 1 inch apart on a parchment lined baking sheet. Bake for 15 minutes in a 350 degrees pre-heated oven. At the end of the baking time, the cookies should start to crack on top and turn white, which means they are done. Don't handle the cookies until they cool for a bit. Then, sprinkle very finely chopped pistas over the top and lightly tap in place. Store in an airtight container only when completely cool. Pre-heat the oven to 340° Fahrenheit. Sift the flour, baking powder, salt, cinnamon, ground ginger, baking soda, nutmeg and ground cloves into a large bowl. Put this aside. Whisk together brown sugar and eggs with a mixer. Beat in the vegetable oil and then the pumpkin puree. Add the dry ingredients mixture alternating with the whole milk in three parts. Mix well and scrape the sides and bottom of bowl between each part. Grease and flour bundt pan. Bake for about one hour. Let the cake cool in the pan and then turn out onto a cooling rack. For the finishing touch, pour the orange cream cheese icing over the top of the cooled bundt cake. Makes one cake from a 2 quart bundt pan. Place cream cheese and confectioners’ sugar in bowl and use a mixer until it becomes a smooth cream. If you are using a standing mixer, use the paddle attachment for the best results. Add the softened butter to the bowl. Scrape down the sides and bottom of the bowl with a plastic spatula and then add the orange zest, vanilla bean or extract, heavy cream, pinch of salt and orange juice. Set the frosting aside until you are ready to pour over cake. Note: the cream cheese frosting also makes an excellent topping for gingerbread or spice cake. My grandmother used to call it "hard sauce." And note what they call it at Cambridge! haha, named after you, friend!! The sauce for sticky toffee pudding is similar to hard sauce, or is a caramel sauce. Mmmm, I'm getting hungry for sweets! My Nana was a devout Baptist and didn't use alcohol even in cooking so she would have modified the recipe. However, since the classic recipe didn't mention cream cheese, I'm not sure now what that was, but of course, no one's copyrighted the name. The Wiki entry does note the oxymoron in the name. "Senior Wrangler" sauce? Love it! This pumpkin cake recipe looks wonderful - will have to try for the holidays. Mix flour and powdered sugar; cut in butter or margarine with two knives until crumbly. Press into bottom of 9x13 pan as a crust; bake at 350°, 20 minutes. Beat eggs till foamy. Gradually beat in sugar, Key Lime juice, baking powder and flour; pour over crust. Bake at 350°, 25 minutes. When cool, sprinkle with powdered sugar. Speaking of baking things, there was an interesting segment on the Weather Channel this morning about the need to adjust recipes for altitude--not just baking time or, perhaps, temperature, but also the amounts of ingredients as altitude increases. The reporter went into various adjustments--of course she went too fast for anyone to note them--but I guess the upshot is, for example, if FRiend Lee were to bake my favorite chocolate cake recipe, she might have to make small changes in the amount of, say, the flour. I'd never thought of this. I knew that it takes water longer to boil at high altitudes than at sea level (I think I have that correct ), but I'd never thought of a need to adjust the amount of ingredients. Yes, I do have to adjust recipes for cakes, muffins and the like. I add in a little extra flour and bake longer at a lower temperature. If not, the cake might fall in the middle. But, in that case, I just apply extra icing, and keep the lights low! My almost-three-year-old grandson is coming for dinner tomorrow...shall I whip up some ambrosia? Shall I make him eat it for two weeks? My daughter confessed on Thanksgiving that she doesn't really care for pumpkin pie. So, I'm whipping up a surprise for her for tomorrow...the pie will be cranberry with chocolate ganache on the bottom! Let me know if you'd like me to post the recipe. It is a King Arthur Flour recipe (although there's no flour in it). In addition, I'm making a chai spice cake with molasses buttercream. Yummy! I miss our recipe organizer, Marcia! bumping this thread.....I've been invited to a New Year's party, and asked to bring a dessert. I'll review for ideas, but I'm thinking I'll bring some brownies, everyone seems to like those. I'll bring some regular brownies, and some white chocolate ones. White chocolate is an abomination, imho. At the supermarket today, an extra piece of paper came out of the register and the operator looked at it and said "you have won a baking cook book, take this to the Service desk" At the service desk the woman said "Sorry we have run out" I said "Doesn't matter, I have never baked anything in my life" She laughed. Maybe it could have got you started, Brian! NO kind of chocolate is an abomination, IMHO. Some authorities, including Joy of Baking, say that white chocolate shouldn't be considered as chocolate because it does not contain chocolate liquor. But it does contain cocoa butter, except for certain inferior products that substitute vegetable fat. And that definitely is an abomination, or, as I like to say, a GDBOAUS! I'm fine wih not considering it as chocolate. Because, hey, it doesn't taste anything like chocolate! I find the varied opinions on White Chocolate very funny. Some people loathe it, some love it. I like it. One of the guys on my bowling league loves it. Put me in the loathing category. It has no taste, except sweet. Made a mincemeat pie yesterday and it's cooling very appropriately on the "pie safe". I saved back some of the pie crust to make the butter/cinnamon/sugar "scraps" for my grandchildren, just like my own grandmother used to do. It's kind of funny, making old-time desserts and timing them on your iphone! Does anyone make savory pies? I have some pie crust left and I'm thinking about making something with my Vidalia fig and onion jam. I'm also thinking of making some shepherd's pies with the leftover lamb, but of course mashed potatoes make up the crust there! No savory desserts of any kind here. We had white chocolate chip cookies, chocolate pudding pie, pumpkin pie (unless you consider that savory), and brownies. Pumpkin pie is borderline savory, IMO. http://www.foodnetwork.com/recipes/persimmon-flans-with-honeyed-whipped-cream-recipe.html Makes you wonder whether you should just toss all your cookbooks. I often turn to Google now for recipies instead of cookbooks. And now the question du jour is, Shall I make the pumpkin pie this weekend, or wait until Thanksgiving morning? I don't remember if you've mentioned your plans for this holiday, but if you're going to have to be cooking a lot of other stuff on Thanksgiving Day, I'd say make the pie ahead of time. But I come from a tradition where holiday dinners are mid-day meals, so there's no time for pie baking that morning. Still, seems like a lot of unnecessary additional work for Thanksgiving Day. Pie is done and safely ensconced in the pie safe! congrats on the completed pie! On the baker's rack for Christmas dinner is figgy pudding, recipe courtesy of the Farmer's Almanac! How funny! Just this afternoon I had an earworm of the line, "Now bring us a figgy pudding, now bring us a figgy pudding, now bring us a figgy pudding, etc., etc.," and wondering what on earth was a figgy pudding. Now I can find out! Yes, it's in the oven now! Some of the cookies my mom and I would bake for Christmas. 1 Preheat oven to 350 degrees F (180 degrees C). 2 Mix well the shortening and butter, sugar, egg, almond and vanilla. In a separate bowl, mix flour and salt and add to shortening mixture. Divide dough in half. 3 Blend red food coloring into one half. Roll 1 teaspoon of the red dough and 1 teaspoon of the white dough on lightly floured board into 4 inch strips. Place strips side by side and press lightly together and twist like a rope. Curve top of rope down to look like the handle of a candy cane. 4 Bake 9 minutes or until lightly browned. Remove while still warm. 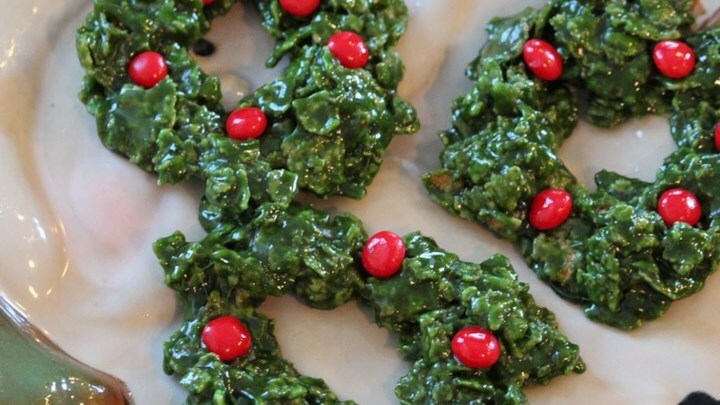 Sprinkle with 1/2 cup crushed peppermint stick candy and 1/2 cup sugar (optional). 2 Add and mix quickly the coloring, extracts, then cornflakes. Drop by spoonfuls in clumps on greased wax paper and decorate with 3 red hots/red M&Ms each. 3 Once cool, transfer to lightly greased serving/storage tray with lightly greased fingers. They forgot to list the red hots! Well, what do you know. . . a recipe for easy cherry cake! Mrs. Twist would be pleased. Oh, time for Halloween treats soon! cookies I made for work this week. Peanut Butter cookies and chocolate chip cookies. Preheat oven to 375 degrees F. Place sheets of foil on countertop for cooling cookies. Combine brown sugar, JIF(R) peanut butter, shortening, milk and vanilla in large bowl. Beat at medium speed of electric mixer until well blended. Add egg. Beat just until blended. Combine flour, baking soda and salt. Add to creamed mixture at low speed. Mix just until blended. Drop by rounded tablespoonfuls 2 inches apart onto ungreased cookie sheet. Flatten slightly in crisscross pattern with tines of fork. Bake one baking sheet at a time for 7-8 minutes or until set and just beginning to brown. Do not over-bake. Cool 2 minutes on baking sheet. Remove cookies to foil to cool completely. 3 cups (about 12 ounces) of chips, 1 cup milk chocolate, 1 cup dark chocolate, and one cup white chocolate. Stir together 1 cup sugar, the butter, milk, vanilla, peppermint extract and egg in large bowl. Stir in flour, baking powder and salt. Divide dough in half. Stir food color into 1 half. Cover and refrigerate at least 4 hours. Stir together peppermint candy and 2 tablespoon sugar; set aside. 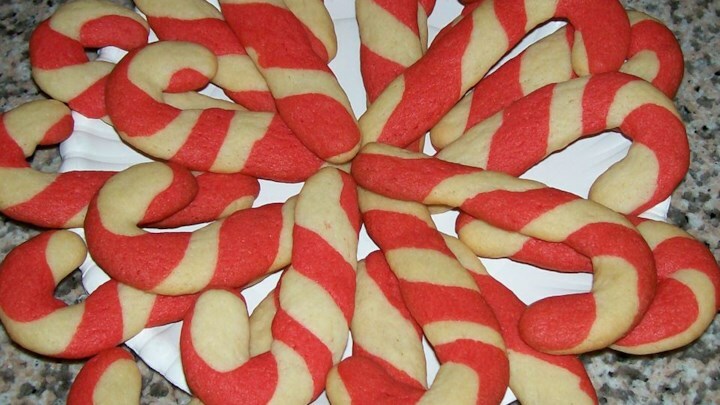 For each candy cane, shape 1 rounded teaspoon dough from each half into 4-inch rope by rolling back and forth on floured surface. Place 1 red and white rope side by side; press together lightly and twist. Place on ungreased cookie sheet; curve top of cookie down to form handle of cane. Bake 9 to 12 minutes or until set and very light brown. Immediately sprinkle candy mixture over cookies. Remove from cookie sheet to wire rack. Cool completely, about 30 minutes. Note - with my first batch, the peppermint sugar didn't stick to the cookies after baking, so I did it before baking with the remaining batches, this worked better. Melt butter in a large saucepan over low heat. Add marshmallows, and cook until melted, stirring constantly. Remove from heat, and stir in the food coloring, vanilla, and cornflakes. Quickly drop heaping tablespoonfuls of the mixture onto waxed paper, and form into a wreath shape with lightly greased fingers. Immediately decorate with red hot candies. Allow to cool to room temperature before removing from waxed paper, and storing in an airtight container. If the wreathes don't take shape, just leave them in clusters on the sheet, they will still look like holly leaves. In the bowl of your electric mixer (or with a hand mixer), cream the butter and sugar, on medium speed until light and fluffy (about 3 minutes). Add the eggs, vanilla and almond. Beat until combined. Add the salt and flour; beat until you have a smooth dough. Divide the dough in half and wrap each half in plastic wrap. Refrigerate for about one hour or until firm enough to roll. Preheat oven to 375°F. Line two baking sheets with parchment paperor silpat mats. Remove half of the chilled dough from the refrigerator and, on a lightly floured surface, roll out the dough to a thickness of 1/4 inch. (Keep turning the dough as you roll, making sure the dough does not stick to the counter.) Cut out desired shapes using a lightly floured cookie cutter and transfer cookies to baking sheet. Place the baking sheets with the unbaked cookies in the refrigerator for about 15 minutes to chill the dough which prevents the cookies from spreading and losing their shape while baking. Note: If you are not going to frost the baked cookies, you can sprinkle the unbaked cookies with sparkling sugar at this point. In the bowl of a stand mixer (or using an electric mixer) combine sugar and ¼ cup milk. Mix until smooth. Add milk as need to create a smooth mixture, one tablespoon at a time. Add corn syrup and almond extract. To decorate cookies, your outline icing should be the consistency of toothpaste, your flood icing should be the consistency of corn syrup. Add food coloring one drop at a time until desired color is reached. Pour into bottles, decorator bags or a cup. Keep unused icing sealed until ready to use. I hope they look more appetizing in person than in this picture. I think they look very appetizing! My, Chuck, you have been busy! Hope those cookies last more than an hour! For my son's birthday on the 11th, I baked a clementine cake!! This cake figures in The Secret Life of Walter Mitty, where Walter's mom Shirley MacLaine bakes one for him to give to the Afghani warlords so they will let him pass into the Himalayas. I bet you've never seen somebody so smitten by a movie that they baked a cake that was in it, have you? Looks scrummy! And looks like a lot of work. Back in the day when I used to bake cookies now and then, I could only manage one batch at a time. 5 batches is very impressive! And the clementine cake looks delicious! hmmm, "scrummy"? I'll take that as a compliment! Actually, it was one of the easiest cakes I've ever made. I was planning to make a chai cake, but then I saw a box of Vietnamese coffee cake at Cost Plus and decided to try it. You just add milk, oil and an egg to make a batter, and you cut 2 Tbs. of butter into a topping mix and alternate them into a cake pan. After baking, I made a vanilla glaze, using the recipe printed on a bag of glazing sugar. After adding the clementines, I finished off by cutting some lime and lemon flowers and leaves off of the trees in my kitchen and placing them all around the edges. It makes a very flavorful cake but one which is light on sugar and carbs. Tonight I'm making "haystacks" which I've always called macaroons. Went to a party last weekend where they were served, with slivered almonds and dried cranberries added. Very scrumptuous. The recipe is very simple with few ingredients and it's from Silver Palate. hmmm, "scrummy"? I'll take that as a compliment! Actually, it was one of the easiest cakes I've ever made. Scrummy is a combination of "Yummy" and "scrumptious" so it is a compliment. I went to a winetasting on Saturday at the Still Museum and these blue cheese and fig savories were served as a dessert. Epicurious seems to think they are an appetizer. Whatever! Little thumbprint cookies made from blue cheese dough, with fig preserves (or whatever you would like) in the thumbprint. It's time for you to make your Cherpumple!!! I'm sure your family will appreciate that you make it for them, Chuck! It's a good thing that I enjoyed making pumpkin pie. I rolled out the crust using my great grandmother's rolling pin that my daughter had new handles made for. The crust went into the pan very well and the filling fit perfectly. I cooked it the right amount of time and set it to cool on a special iron pie holder. Then, when I picked up the pie holder to take it to the table, it slid right off onto the floor! The flaky crust separated into a thousand pieces. I was crushed. But Friend EDelmar picked everything up and even vacumed the floor for me. And everyone enjoyed ice cream and spiced peaches for dessert. The pie wasn't missed. I'm going to have to make another one soon, just so I can enjoy the taste of it. I think I'll just get rid of that iron pie holder though.